Shade’s destiny was never meant to be typical, no matter how hard she tried to avoid it. The inadvertent discovery of the bewildering Land of Faerie throws her into a perilous journey to find magic only she can wield. Along with a band of magical misfits and warriors, she must fight past innumerable dangers, surpass unimaginable hardships, and face all who are bent on sabotaging her mission to the very end. The more Shade’s magic grows, the more the power of the Land of Faerie calls to her. Blood, memory, treachery, and most of all, love will push her past boundaries she never knew existed. All those she’s bound to must take arms against an unrelenting evil determined to rule all of Faerie and humankind, the Unseelie Queen Aveta, or all will be lost. This is a compilation of the first two books in a 5.5 book (currently) series. I was provided a copy of the book in exchange for my honest review. This is the first book about faeries (and by this author) that I've read. I was drawn in to the faery world and the characters right away. The faery world that Ms. Purdy describes sound so beautiful that I'd love to be able to see it with my own eyes. Several times throughout this book I couldn't help but think that Ms. Purdy drew on her readings and viewings of the Hobbit and Lord of the Rings stories. At least that's what came to my mind as I read this book. I always find myself captivated with characters who have non-human "powers" and that was again the case with Shade, this book's main character. At first she appeared as the typical teenager upset that her mother has forgotten to pick her up from school. But then we learn that her father has died and that Shade has had to grow up as a result. This comes into play repeatedly throughout the book as she has to accept loads of responsibility to save the Faery world. I was impressed with her resolve to help and do what she had to. There is a small love triangle involved in this book. I say small for a few reasons. One, the characters do little more than kiss. Two, Shade quickly realizes she is in love with one over the other. As the result of an attempt on her life, Shade becomes bound to one of these love interests. This is another aspect of paranormal books that I always love - when the main characters are bound together in some way. They usually start out not liking each other and then grow to love each other. That's the case here. The only issue I had with this book was Shade's siblings. We are told early on about her siblings. I, however, got the impression that they were quite a bit younger than Shade. Later in the book we learn that two over her siblings are just one and two years younger than her. It just felt like their ages were changed mid-book as an afterthought. But this issue wasn't big enough to detract from my pleasure in reading the book and won't keep me from continuing the series. I can't wait to continue reading this series to see what happens! I've wondered about Purdy's writing - may even have a book by her on my kindle - so I'm glad to see that you enjoyed the first few books in this series. 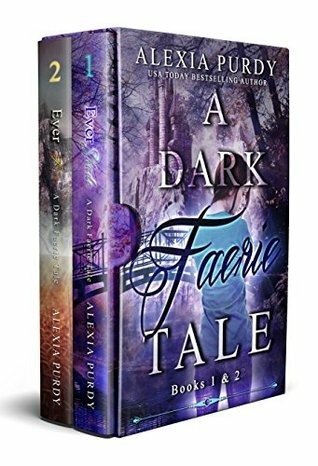 I love stories involving fae (have a few suggestions if you want them) so that's a draw, especially since you liked Purdy's world building. I'll have to see which of her books I already own and move them up in the queue. Great review, Carey! Hope you're doing well!! I can always use recommendations!